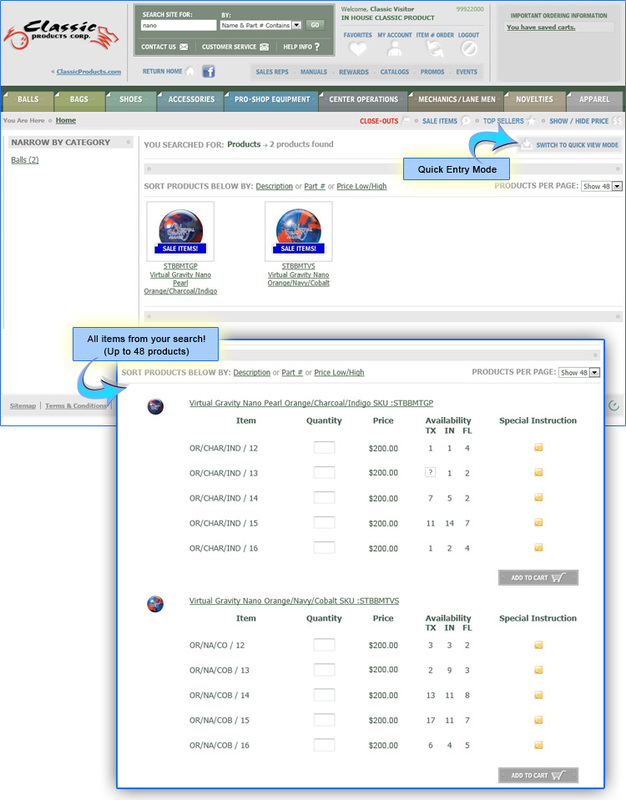 Quick Entry Mode is the fastest way to add several items to your cart at once. Click the Quick Entry button to view all sizes and weights available for all of the items on your screen. FAQ: "Why use Quick Entry?" Works great for ball weights, grip sizes and colors, apparel and so much more! When you do a search (i.e. Nano) all of your results can be shown in the Quick Entry Mode by clicking the button at the top. All items in your search will then be listed with available sizes, weights, color etc. as well as our inventory for each warehouse! Quick Entry can also be used on the details page when you need to order multiple weights, sizes or colors. Either select Quick Entry from the dropdown menu, or click the button located below Add To Cart. FAQ: "Why doesn't the inventory show when I use Quick Entry?"